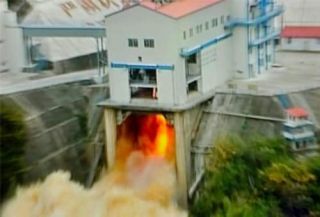 China tested a new liquid oxygen and kerosene engine for its planned Long March-5 rocket on July 29, 2012. China tested a new rocket engine Sunday (July 29) for a more powerful, next-generation booster that will be used to help the country construct its first space station in orbit, and for future missions to explore the moon, according to news reports. The new liquid oxygen (LOX) and kerosene engine is being designed for China's planned Long March 5 rocket, which will be more powerful than the current Long March 2F rockets that have been used to launch a space lab test module and an astronaut crew on missions to test docking technologies in low-Earth orbit, according to China's state-run Xinhua news agency. The more capable Long March 5 rocket is expected to help the country achieve its goal of constructing a space station in orbit by the year 2020, as well as play a key role in China's future space exploration aims beyond low-Earth orbit. The rocket's maiden launch is expected to occur in 2014, reported Xinhua. On Sunday, the new engine endured rotational tests of almost 20,000 revolutions per minute, and was exposed to temperatures of up to 5,432 degrees Fahrenheit (3,000 degrees Celsius) for 200 seconds, Xinhua reported. "The successful tests confirm the reliability of China's LOX/kerosene engine," Lai Daichu, Chinese test commander, told the newspaper China Daily. The test was conducted by the China Aerospace Science and Technology Corporation (CASC) in the city of Xi'an in northwest China. According to Chinese media reports, the Long March 5 rocket will be able to launch a 25-ton spacecraft or satellite into low-Earth orbit, or launch a 14-ton payload into geostationary orbit. China's most recent space mission, Shenzhou 9, lofted a three-person crew (which included the country's first female astronaut) to the orbiting Tiangong 1 space station prototype module. The flight marked China's first manned docking in space, making it only the third country to accomplish such a feat. The country outlined its ambitious space program goals in a white paper that was released in December 2011. In addition to constructing a 6-ton manned space station in orbit, China intends to return lunar samples to Earth by 2016 using a robotic spacecraft. In the report, Chinese officials also discussed initial studies of manned missions to the moon.